“Added ‘Random’ menu as preset on Equalizer screen!” Hello, everyone! I’m Ryota, Hayaemon developer. On this update, we added ‘Random’ menu as preset on Equalizer screen. By using new function, we can change equalizer at random. Please try it. “After development” A long time passed since I said “I want to make a book of update log” with the momentum. These days, I feel the mood of “Oh, that was just a momentum”. How is everyone going? Well, at last I will start to make a book. Because I’m serious. I think that I will make a book of this update log seriously. 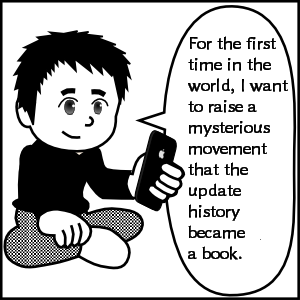 For the first time in the world, I want to raise a mysterious movement that the update history became a book. Please don’t listen to me the idiots like ‘Why do you make a book?’ Because I want. The idea of “Why” is too logical, is not it? In the future times, I think that it is better to think “somehow”. I think that such a time is coming. I make a book of update log, but I think that it does not matter whether it sells or not. Even if it does not sell, I will write it in this update log. Based on my experience of not selling it, I will also write an update log and make a book of volume 2. So, I start to move. First of all, I have considered the title and preface of the book. Title is this. “As the result of continuing to pos long sentences in the iOS app’s update log, popularity has appeared in the update log rather than the app, and I decided to make a book at last! How many characters is okay as the book title?”. Well, here is the preface. “At last, I made a book of Hayaemon update log!” Hello, everyone. I’m Ryota, Hayaemon developer. I already spoke everything with the title of the book, so I will not talk much anymore. Yes, I made a book. A book! At last. Hayaemon’s update log became a book! Thank you. This is the preface. I wonder if books can be made with such momentum alone. Please tell me if you have experience. Well, I want to telling to project members the progress of “I want to deliver Hayaemon to one million people”. Current total download number is 221,885. The remaining number is 778,115 people. It came closer! Please promote Hayaemon. Please rate Hayaemon on the App Store. Thanks your cooperation. So Enjoy “Your” Music with Hayaemon! !